[By Nick] Not too long ago, I was invited to take a tour of a new grocery store that recently opened in Wilton. Being that I’m a sucker for all things new, I accepted the offer. 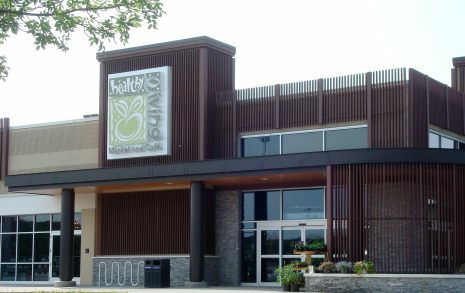 Now this isn’t your average grocery store, this is Healthy Living Market and Café and just the second store of its kind with the original being in Vermont. They’re an organic/all natural store that really takes pride in what they do and what they offer. From their in-house butcher shop, where no part of the animal goes to waste, to their excellent bakery, in which I got a few tasty samples to take home with me, everything they do is with the utmost care and precision. I was most interested in one thing though and that was their frozen dessert section. HLM carries a variety of different brands such as household names like Ben & Jerry’s as well as local creameries such as Ronnybrook Farms. What caught my eye the most was their selection of Jeni’s Splendid Ice Creams. You know Jeni’s right? The company that charges around $10 for a pint of the supposedly best craft ice cream in the country. Well this was my first time actually seeing them in person. My lovely guide, Lyndsay (seriously she’s pretty awesome and is very passionate about ice cream) was willing to let me choose any two of their flavors to bring home with me to review. This had to be one of the hardest decisions I have ever made in my ice cream career but as the title states, I decided to go with Jeni’s Dark Chocolate and a flavor to be covered at a later date. What? I need to keep some secrets! 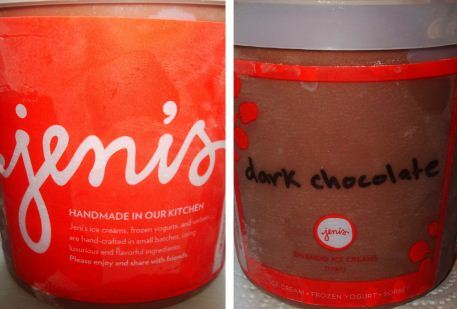 Jeni’s describes this one as “Mouth-filling, palate-gripping, intense chocolate flavor with a fudge-like texture. Pleasingly dry finish.” I don’t even know how to comment on that other than by saying GET IN MY MOUTH NOW! But wait, let’s talk about the packaging first. 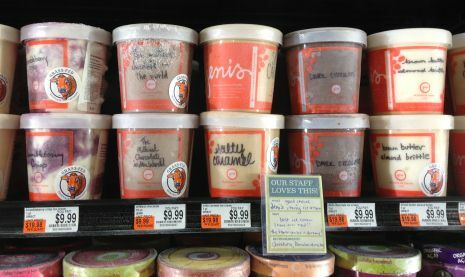 Like Talenti, Jeni’s utilizes a clear reusable container. I really like this trend. Not only do I get to get a glimpse of the product before I purchase but I’m also saving some tree or something among those lines. That’s a win-win in my book. What separates Jeni’s design is that they hand write the name of each flavor on the container. I do not envy the person whose job that is. 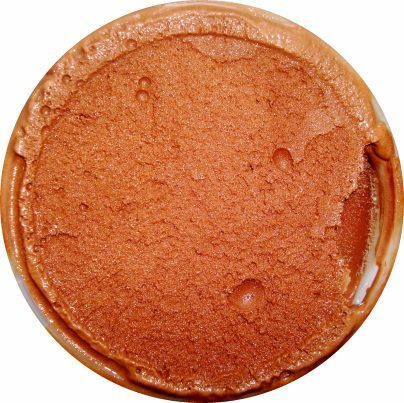 Even with being able to see the product through the container, I’m still taken aback by just how rich and chocolaty this one looks. 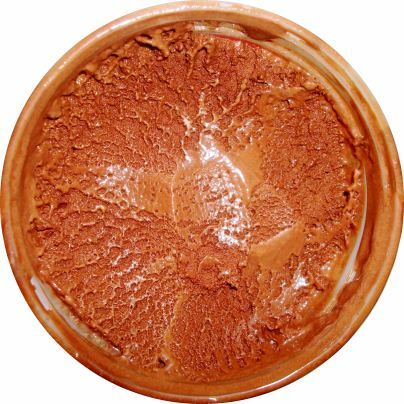 Most chocolate ice creams seem to look dull but this one has some character. Dark chocolate tends to be very strong smelling but there was none of that coming from this flavor. Actually, I don’t think there’s much of an aroma at all. Seeing as taste is all that matters, I should probably eat some of this now shouldn’t I? So how was it you ask? Well let’s start with the texture which was interesting to say the least. It’s an extremely dense ice cream with a creamy texture I have yet to experience in a flavor up to this point in my life. What was surprising though was that there was a slight bit of chew to this one. I guess they weren’t lying when they said it has a fudge like texture because that’s all I could think of while I was eating it. Since this flavor is a base only, it really keeps things interesting textually. Just from a textural standpoint, this one seriously impresses me but we still need to talk about the taste. This is easily the darkest ice cream I have ever tasted. The bitterness is strong but there are fruity notes that round out this flavor perfectly. Taste wise, I feel as if I’m eating a very high quality bar of chocolate and honestly, I couldn’t be happier. This is everything I want and more out of a dark chocolate ice cream. I’m a mix-in fiend but this one is a flavor that deserves your full attention and adding anything to it would only detract from the experience. But wait there’s more! Remember that mention of a dry finish? Well they weren’t kidding there either. After you swallow, your whole mouth becomes dry and you start craving something to quench your thirst. In my case, this just made me want more and more of the ice cream. Man this might just be my new favorite base only and chocolate ice cream. All I can say is wow Jeni’s, you guys live up to the hype and by far exceeded my expectations. Now I can’t exactly say I would buy this flavor again though. At around $10 a pint, that’s just too high of a price tag to make a consistent purchase. I could easily buy 4 pints of Stewart’s Dark Chocolate ice cream for the same amount, plus Stewart's version was named the world’s best dark chocolate ice cream in 2010 and 2012 at the World Dairy Expo. That being said, I would recommend everyone to give this one a try if possible. This is an all around excellent flavor and I believe everyone should experience it at least once. I’d again like to thank the awesome people at Healthy Living Market for all they have done for me. Without them, I don’t think I’d ever have gotten to experience such an amazing ice cream flavor. Stay tuned for the other Jeni’s flavor they hooked me up with and if you’re ever around one of their stores, don’t hesitate to stop in. Buy Again? The price is a bit steep so maybe once a year or for a special occasion. Mitch, get your keys and head to toga to grab a pint. It will be the best $10 you'll spend this year. Ellen, I would be hesitant to buy their ice cream if I never tried it before. Now that I have I'd say it's worth the $10 to try at least once. It would have been like Sophie's Choice for me to pick between all those flavors! I have seen these at my local health food market and they do look wonderful, just too spendy. Anon, I was considering playing eenie meenie miney mo when I was given the choice of two flavors aha. Thanks for the comment! I've seen this line at Whole Foods and all I could think was "$10 for a pint..seriously?" And I think B&J is too much at $4 a pint. Nonetheless, I'm glad you enjoyed it but unless they bring the price down I don't see how the average person can afford this ice cream. Stride, I totally agree with you. I doubt I would've bought any of their flavors if it was my money being spent. That said, now that I've tried it, I'd say it's worth at least one purchase to try it out. Is there any way this company can send you some free samples of their other flavors? In the case of a positive review, I will be inspired to purchase at least one pint, just as the review for Haagen-Dazs's Sea Salt Caramel led to my purchasing of it (and loving it). Stride, I do have another one of their flavors in my freezer right now that I was given on the tour. They don't seem like the type to send out free samples but I'll see what I can do? Is there any specific flavors you want to see reviewed? If they don't send any I would consider spending my own money and pick up a pint to review for you. How kind of you to offer your own money just to write a review for me! Their Brown Butter Almond Brittle is definitely a different flavor than we have seen with other ice creams, so maybe I'd like to see that one reviewed or their Salty Caramel, Milkiest Chocolate in the World, or Buckeye State Pint. I also see that they have a Cayenne flavor. They should be on the food show network's Unique Sweets for these unique ingredients. Anyways, don't feel obligated to write a review unless you really want to because the money could be better used elsewhere in this day and age. Stride, lucky for you, the other flavor I have is one that you want reviewed. I'm not going to ruin the surprise so keep an eye out for the review in the near future! I splurged on this ice cream and ended up feeling ripped off because I didn't think that it was that good. Anon #2, I actually picked that up recently and plan on having a review up soon. Lets just say I didn't feel the same way as you with that flavor.